WOW, it's the already time for the last SCRAPTURES Finally Friday for the month. It's been fun making cards and layouts with the July 2014 card kit which featured "We Are Family" by Echo Park. 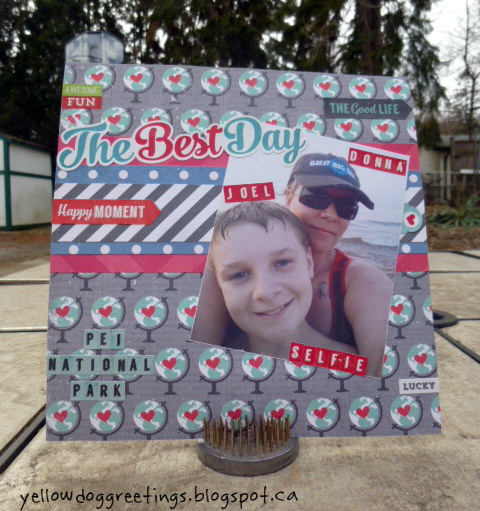 This week I decided to make another 8x8 layout from our trip to PEI last summer to "match" THIS ONE I did a few weeks ago. Yep, I am one of those people that LOVES selfies!! They are so much fun!! Joel and I took selfies all over the island. This picture was taken on one of the awesome beaches in Prince Edward Island National Park, can't wait to go back there this summer!! On this particular day we sat on the beach and watched the sunset, soooo beautiful!! Love the selfie, great page. great colours.